I just started riding at the age of 46. I have been a passenger for about 3 yrs on my b/f's bike. He has encourged me to get my endorsement to ride my own. I gotta say thank you to him and i love him for getting me started on my own. 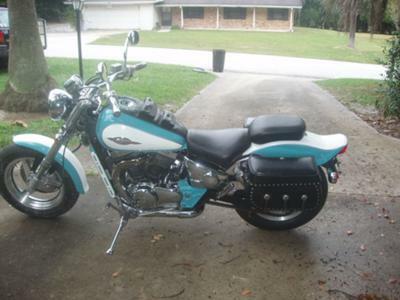 He got me my first bike a 98 Suzuki Marauder VZ 800. It was a lotta work to get the bike on the road but, we done it. Then right before I got my endorsement he bought me a Kawasaki Vulcan 1500 Classic. I have got to say I really love this bike. It's center of gravity is amazing. I am still trying to get use to the hydralic clutch but, with more riding it is getting easier. I named my bike T's Thunder it is so loud it set car alarms off lol. 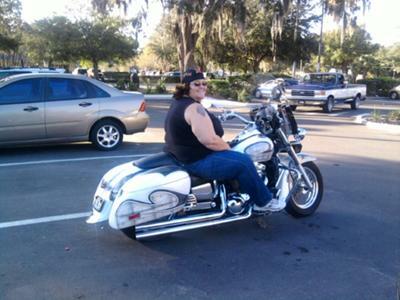 Tammy, Both bikes are really nice! That b/f is a keeper for sure. Have lots of fun and keep us posted on your riding adventures.